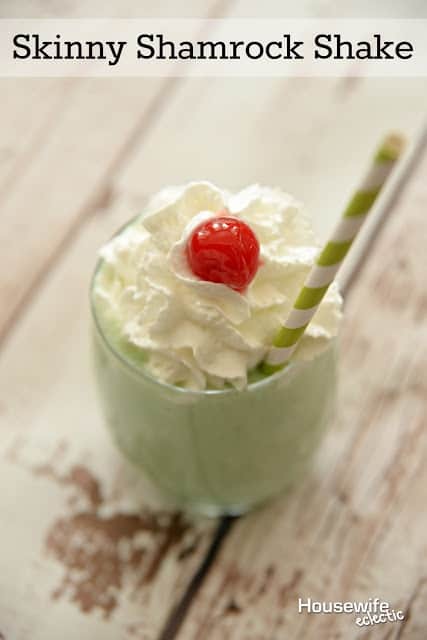 I love a delicious mint shake. Every year I have always looked forward to the limited time of year when Shamrock Shakes are back at McDonald’s. I used to drink them all the time as a kid and as a teenager and then one day when I was an adult, I made the mistake of looking at the calories of it. While I still grab the real thing once a year, I like to enjoy the flavor without giving up the healthy lifestyle I work towards. 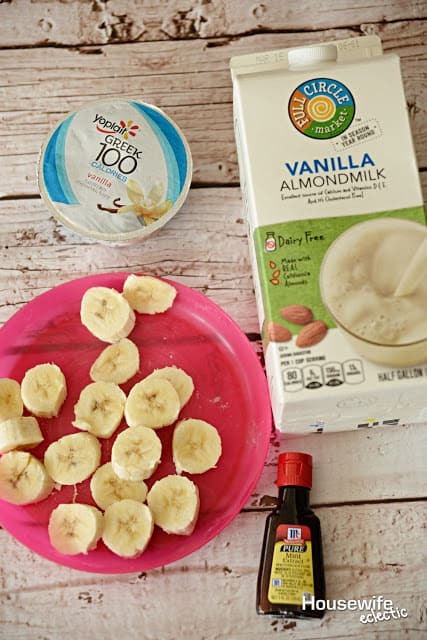 This skinny version is delicious and SO much better for you. There is protein, fruit and the taste of mint. Yum! Add the frozen slices of banana, almond milk, yogurt, a small handful of ice and if you want a couple drops of green food coloring. Start with 1/2 teaspoon of peppermint extract and blend it all together. If it isn’t minty enough, add a little more mint and blend again. You can top it with light whipped cream and a cherry, but when I am going for a really light treat I omit this step. This shake is smooth, delicious and has just the right hint of mint. Most of the time I am not even tempted by a Shamrock Shake anymore! Do you have a favorite mint treat? That souds so good. I bet my kids will love this. Yum. Yum, a healthier version of this delicious shake. I can't wait to try it out. Adding it to my YumPrint collection. Sounds so good! I didn't even think about adding bananas but I bet you can't even taste them over the mint! This sounds truly delicious! I'm really not a fan of food coloring so I wonder if can use something else to make it green. Either way I would love to try this. My kids and I are big into smoothies right now! I am going to make this for them on St. Patrick's day! My daughter loves these Shamrock Shakes, but I don't like to purchase them for her (#meanmom). But I really love the healthy version that I can totally make at home for her! this looks really easy to make! I'll have to sharing with my friends who miss Arbys one that they had for a while. this sounds so good especially be 'skinny'. And I love anything that has peppermint extract in it as its so good for flavor! I've never had a mint flavored shake before but this looks tasty! I also love that it's simple and healthy! Wow this is awesome! I 'm likin the word Skinny! Thanks for linking up to Merry Monday! Pined & Sharing on Fb! Have a great week! I recently saw how much sugar are in these shakes from McDonalds's! Never never never buying one! Thanks for the healthier alternative! And thanks for linking up at the #HomeMattersParty !